KIM RICHMOND is an active and versatile musician based in the Los Angeles area. His first love is jazz, and his primary jazz voice is the alto saxophone. He has, however, been involved in nearly every facet of the professional music industry, both as a player and as a composer/arranger. His instruments are alto, soprano, tenor and baritone saxes, clarinet, bass clarinet, and flutes. Kim has been a member of the orchestras of Stan Kenton, Louis Bellson, Bob Florence, Bill Holman, and Vinny Golia among others. His own Kim Richmond Concert Jazz Orchestra is a workshop for his writing, conducting and leading. His Ensemble (sextet) is a platform for more free-form expression and improvsation with the members playing and Kim's writing being the key factors. His current group is The KIM-PROJECT, co-led with vocalist Kimberly Ford, and is a tribute to the music of Herbie Hancock and Joni Mitchill. Kim is also a consummate educator. 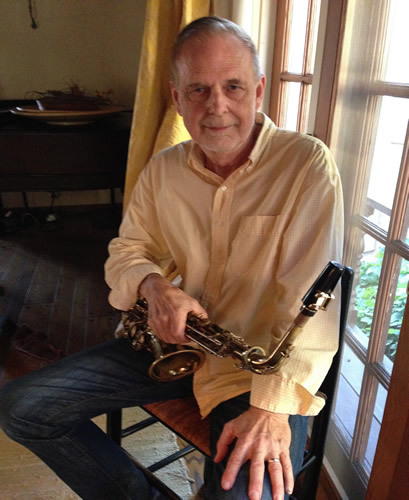 He was for 12 years an adjunct professor in the Jazz Studies department of University of Southern California (teaching combos, composition and saxophone), and does numerous jazz camps and clinics in the Spring and Summer of each year. He is on staff at many of the Jim Widner Summer Jazz Camps, and is involved in running the Northwoods Jazz Camp for grown-ups and the Santa Barbara Jazz Workshop (with co-director Kimberly Ford). He most recently was an instructor in the Jazz Department of California Institute of the Arts, and at California State University, Fullerton. Kim is a past-President of ASMAC (American Society of Music Arrangers and Composers), which provides masterclasses and avenues of learning for all interested. Whatever his mode of expression, be it instrumental performance, composition, arranging and conducting, KIM RICHMOND is striving to express a uniquely original voice, combining his extensive experience with the new sounds of our evolving musical world.